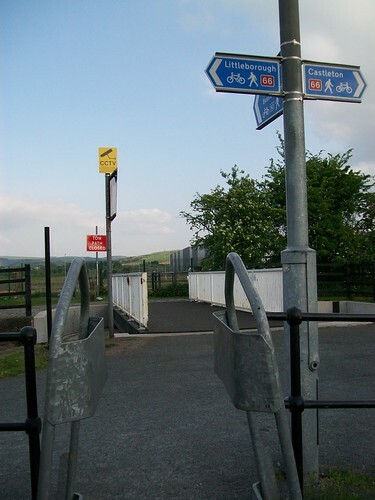 Crap Cycle Paths in Rochdale – An update! Was it really over a year ago that I took a very similar photo? 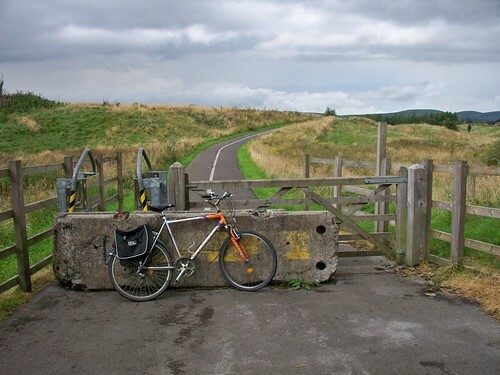 Yes it was… way back in May 2011 I wrote about closures on NCN 92, one of Rochdale’s own answer to The Netherlands. This weekend I attempted my longest bike ride yet, the target a pint of Darkstar’s finest at the Evening Star. This was always going to be a challenge and sadly I gave in 15 miles short in Haywards Heath. But not without some adventure and some lovely Southern scenery. 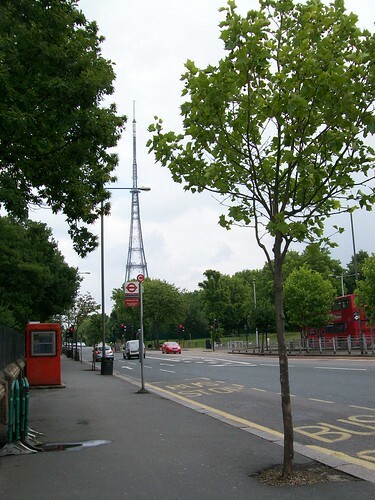 Heading out from home the first stop was Crystal Palace, 17 miles down the road from home. A short pause for a quick snack and drink before an excellent run down the other side of the hill. At this point I wasn’t following a route map, just trying to point in vaguely the right direction. This was probably a mistake! 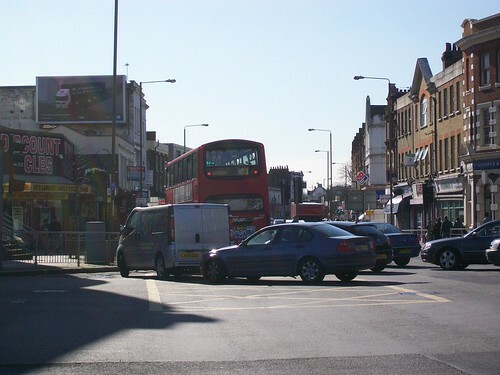 Seeing signs for Bromley and Beckenham I turned westwards and ended up on the edge of Croydon near Selhurst. Not something I really wanted – Croydon is a very motorised place, fully of dual carriageways and car parks. This diversion easily added 2 miles compared with the route I could have taken by heading towards Beckenham. Oops. Eventually I fell out of the urban sprawl and onto country roads. So here comes the ranty bit. In my planning I’d looked up a couple of routes, using CycleStreets and Sustrans. 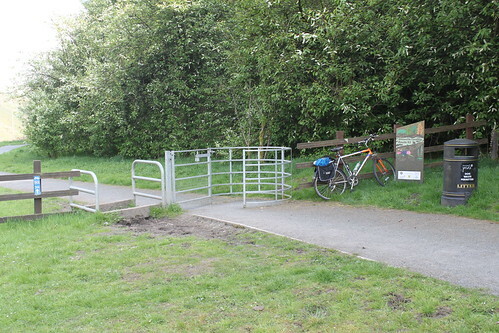 I really don’t know why I bother with the latter – I’m more and more convinced each time I try a Sustrans route that it’s been designed for someone with a 4×4 and bike rack who likes a slow pedal at the weekend. 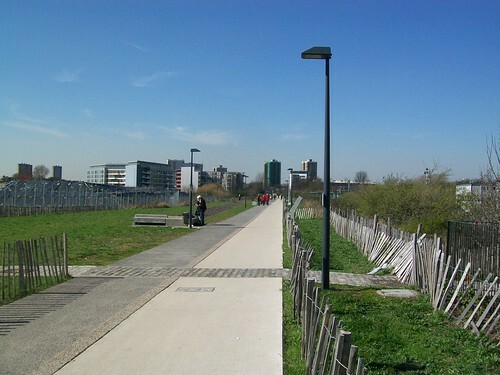 NCN 21 is Sustrans London to Brighton route, or more specifically Greenwich to Brighton route. So perhaps you might expect that connecting two cities it is a well paved, waymarked route allowing comfortable progress of 10-15 miles per hour. I’m not exactly Chris Boardman after all. Sadly it isn’t. Just 100 metres after finding the route at the White Bear, it turned into a muddy ditch. Since destroying my pedals on the way to Southend (and possibly the other rides before that) my bike is currently out of action waiting new pedals and retirement in the north. This mean’s I have Ruth’s Trek road bike – it’s not designed for this and this slowed me right down to 5-8 mph. 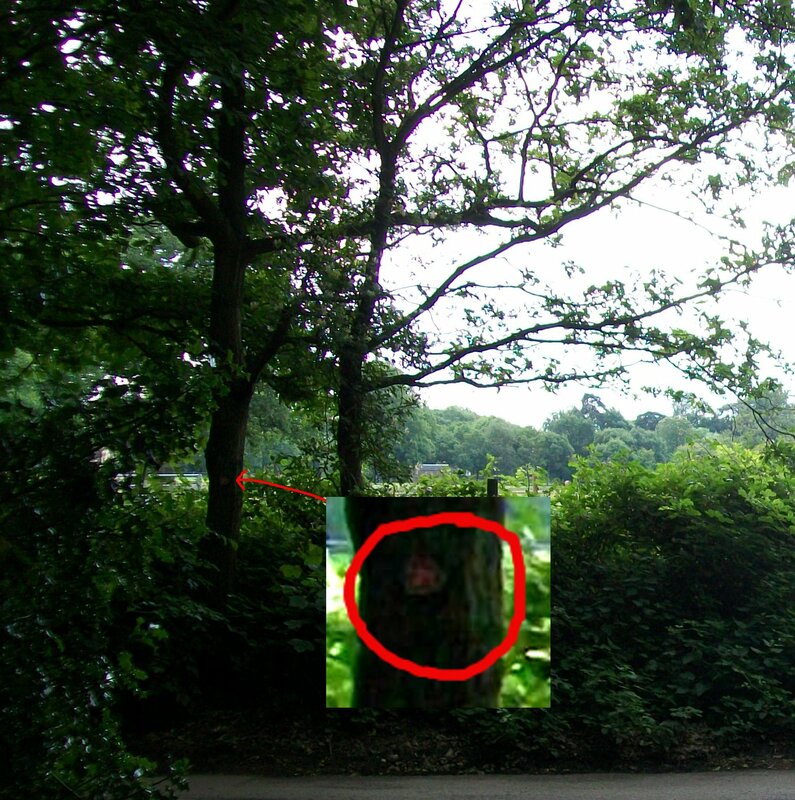 The route is waymarked, but these are often small hidden dark coloured signs on dark trees. Admittedly not a great photo but if you can spot the sign good on you! 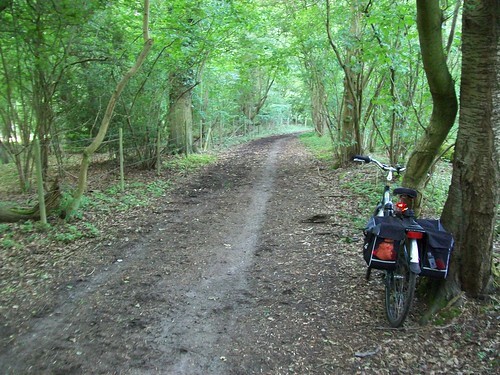 As soon as the next sign pointed onto another track, I gave up on NCN 21 and took to using maps and minor roads. 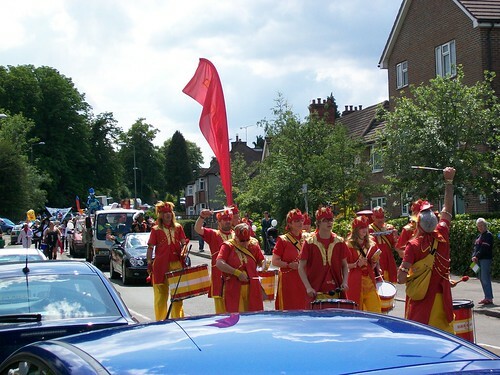 By Caterham (mile 32) I was getting ready for the next break – but instead I got held up, by a carnival! This 5 minute wait proved a useful little boost. 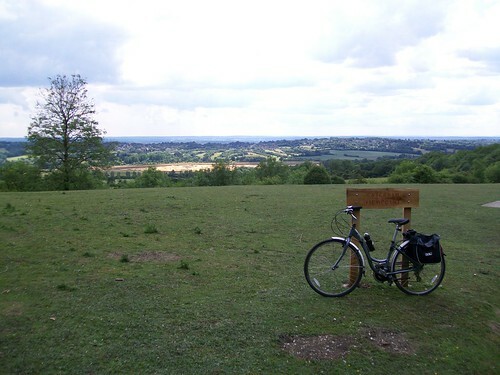 Just over 35 miles, the pit stop proper arrived – the Caterham viewpoint. It’s a great view with the M25 completely hidden from the top. You can still hear it though – in the distance, the South Downs and the next lot of challenges. By this stage I had started to flag a bit – I’m not convinced I’ve got the diet right on a ride to provide the optimum level of energy. 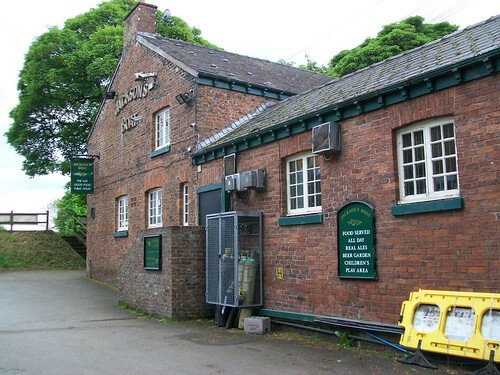 At mile 42 I found another pub to take on water, the Dog and Duck close to the village of Outwood. I was fast running out of afternoon and it started to become clear that I wouldn’t get to Brighton, at least, not if I wanted to get home at a sensible hour. So I switched the target to beat 55 miles so that at least I’ve cycled further in a day than I’ve walked! 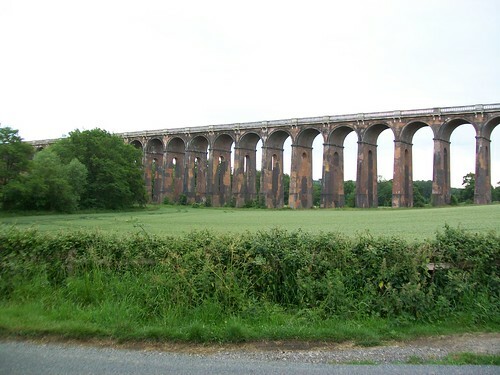 The Ouse Valley Viaduct just outside Haywards Heath provided a last breathtaking scene, this time man made countryside as the road dips down just above the river before climbing into Haywards Heath itself. Arriving just after 6pm, it had taken me 8 hours to travel the 57.6 miles – with stops. According to the GPS thingy, a moving average of 10mph, with my actual moving time being just under 6 hours. Onto a train by half 6 and back in London sometime around 1915 leaving time for one last photograph. It’s not long now until ‘the big one’ – the c2c ride from Whitehaven to Tynemouth. Our maximum distance per day is around 45 miles. Now it’s just the hills to worry about! For the Easter bank holiday weekend I upped sticks with the masses and headed west, to Cornwall. 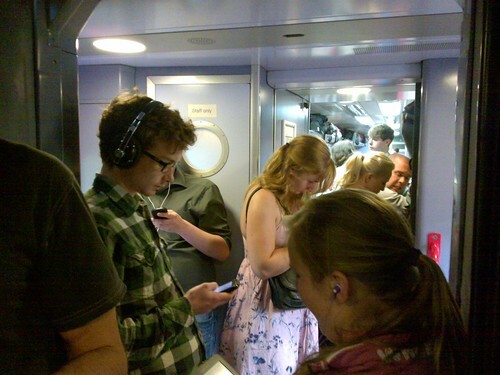 I knew the train would be busy on Friday but I wasn’t quite expecting how busy! Having bagged the last unreserved bike space on the train (5 of 6 were pre-reserved – by the time I got off there were far more than 6 bikes in the compartment…) there was no way I was getting off until Bodmin. So standing it was for the 275 or so miles to Bodmin Parkway. I actually didn’t mind standing too much – with my earphones on, some fizzy drink, fresh air from the opening windows and something to read it was bearable. Changing to a steam train here meant I could grab a cup of tea and a break for a few minutes rather than going straight into tackling the Cornish hills. 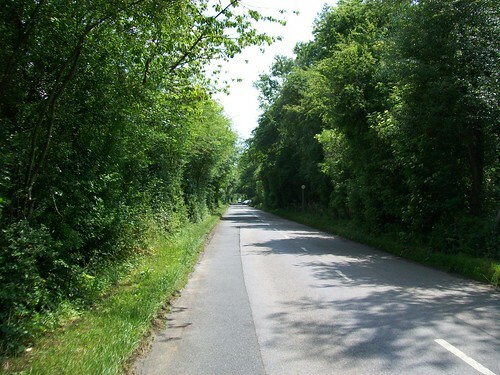 From Bodmin town I could pickup the Camel Trail, one of the major Sustrans routes stretching the 20 miles down the Camel valley to Wadebridge and Padstow – a former railway, so well engineered with nice easy gradients. 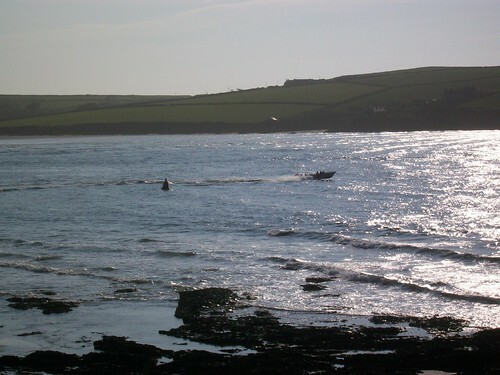 For the final section of journey from Wadebridge to Polzeath on the north coast I took to the road. This was harder than I imagined, with 4 fairly major climbs (for a city dweller anyway) as well as a very steep decent into Polzeath itself with the road covered in sand from the beach. (Shortly after I learned the art of configuring v-brakes). Here I spotted an unusual use of an underground roundel. 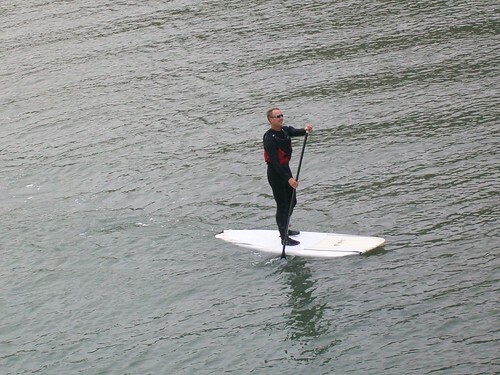 Paddle surfer! - there were loads of them! 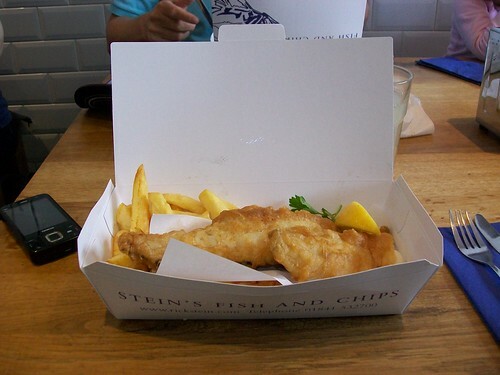 At the end of the trail is Rick Stein’s fish & chip shop, which was pretty fabulous. 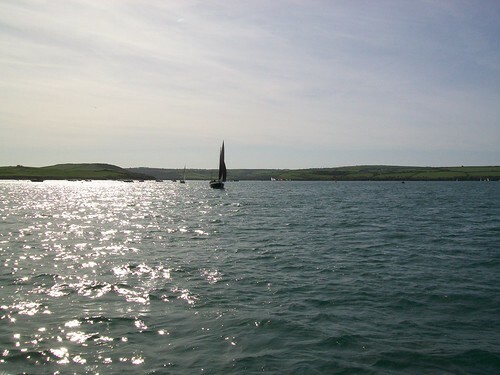 Padstow / Daymler bay is the Camel estuary and used by many speedboats. Too soon, Sunday came and it was time to head home. With a train reserved at half 2 from Bodmin (no way I was standing all the way home too!) I set of reasonably early so as not to rush too much. Instead of taking the mental road route back to Wadebridge, I opted for the gentle road down to Rock (home of Sharp’s brewery and many many posh people) to take the ferry to Padstow. 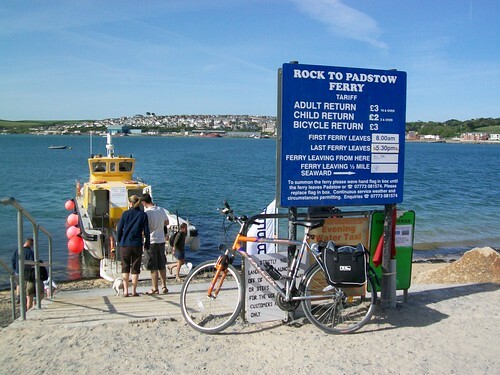 This is great facility available for cyclists to use as the Camel Trail starts just on the other side of Padstow. Just £3 for a single trip across the river. It’s a tidal estuary, but on a lovely day it isn’t at all choppy. With plenty of other traffic to avoid, the ferry nips across the water as quickly as possible. All too soon, I was back on dry land on the quay at Padstow and almost ready to pick up the trail again. This meant easy cycling for the 12 or so miles back to Bodmin town which was really appreciated. Particularly with full panniers weighing me down somewhat… From Bodmin town to the Parkway station was more challenging. A proper new Sustrans route, this meant sudden turns, hairpin bends and a general feeling of “am I going the right way?” The early (ish) start meant I had missed the trail traffic and landed myself in the Parkway café for a pasty and brew. The UK must be the only country in the world to use a teacup/saucer to indicate a buffet! Having been in Manchester for Uncaged Monkeys on Friday, on Saturday it make perfect sense to head out for a ‘late running’ wheelers brunch, a Manchester cycling meet up. I was kind of expecting breakfast somewhere but actually we headed down to Jacksons Boat on the ‘Cheshire’ side of Chorlton Meadows. The whole point is for like minded ‘normal’ cyclists (i.e. not speed freaks in lycra) meeting together. Topic of conversation doesn’t have to be bikes/cycling/infrastructure but we did talk about that. Quite a bit as it turns out. In the mid-afternoon grey (Manchester is able to demonstrate all 256 shades of grey) we took a more circuitous route back to Chorlton via Sale water park and some cycling infrastructure, I’d guess provided by Sustrans due to the frequency of anti-cycling gates. This isn’t a direct route between conurbations or even between major centres of employment so maybe it doesn’t have to be a cycle superhighway. But even then, why put in cycling sign-age and but infrastructure that slows you to walking pace? How is that going to improve the modal share of cycling? Having tackled the climb and descent into the Calder Valley, in the nicer weather of Thursday I went over another hill into the Irwell Valley. 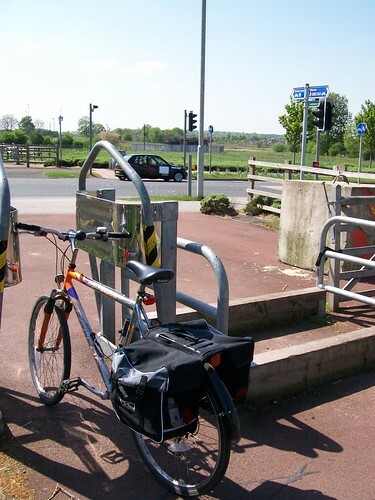 I started by using part of Sustrans (regional) route 92, though Kingsway Business Park, complete with anti-cycling gates. From up here it was down into the Irwell Valley into Rawtenstall where I stopped for a cup of tea before climbing the valley to Bacup and dropping back towards Rochdale. Just north of Whitworth I picked up route 92 again, but only stuck with it for about 1 mile before returning to the road. 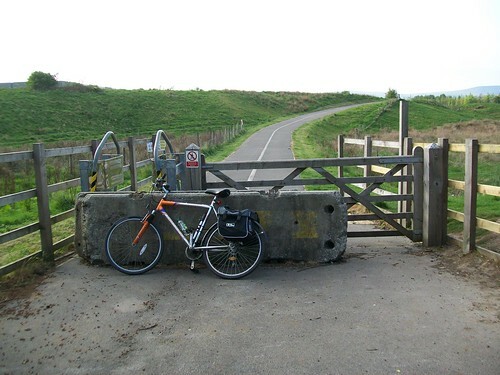 Too circuitous and far too many obstructions – I think there were 6 kissing gates in 1 mile! 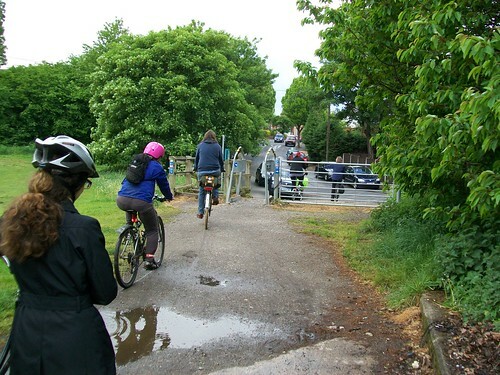 For me this is a footpath, not a cycle path – I certainly didn’t get on wheels to stop every few minutes to lift my bike over an obstacle! 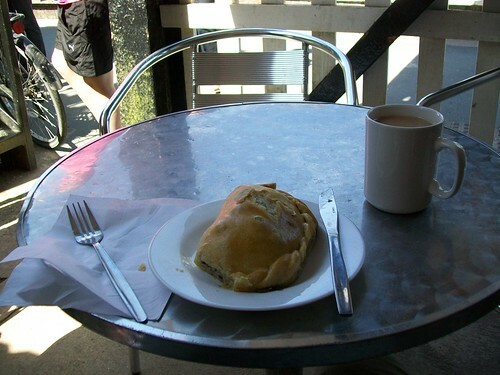 After another cup of tea and some advice, I went back to route 92. Thankfully on the other side of Whitworth the trail does improve following more closely the ex-railway line over the stunning Healey Dell viaduct and the much less stunning, glass lined, Syke Tunnel. The signs then disappeared for a while whilst I weaved my way through the one-way streets of Hamer back towards the business park. Here I found my earlier route had been a connecting route, with the main route 92 actually blocked through the business park. Shame as from either end it looked like a reasonable (if a little windy) off road route. Notching up a little over 30 miles in one day, including a reasonable hill I’m getting much closer to being confident enough to cycle the c2c in 4 days. Next challenges are to push the distance out to 40 miles in a day and to start to cycle every day. This will be hard! 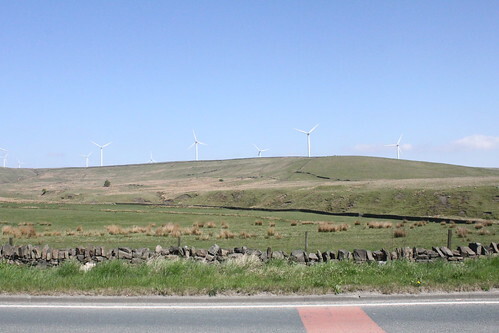 Having successfully managed to stagger across the finish line at Bogle, the next challenge booked in the diary is the c2c. 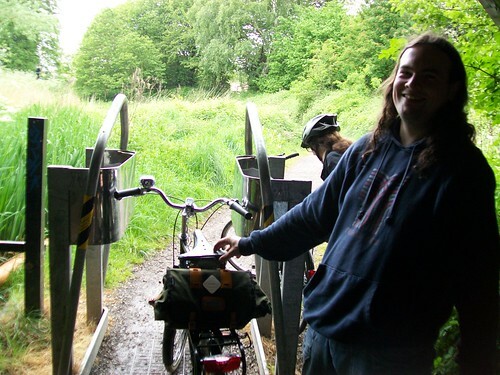 At at the moment most of my cycling is relatively short utility trips (i.e. shopping and commuting) this is something else to ‘man up’ for. With a planned completion date of June, it’s time to start training properly! 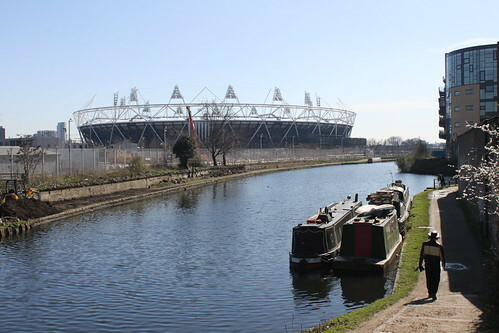 Yesterday provided a glorious day here in London so I took the opportunity to check out East London’s ‘greenway’, cycling down through the Walthamstow marshes to it’s start at Hackney Wick. At the moment the Lea/Lee* valley paths are being upgraded for the Olympics so there are a few diversions but once onto the Greenway you start to see what London is capable of infrastructure-wise. The Greenway cuts all the way across the borough of Newham, I believe it’s the main sewer from Hackney to Beckton sewage works. (It certainly smells that way when you pass by a manhole cover!) 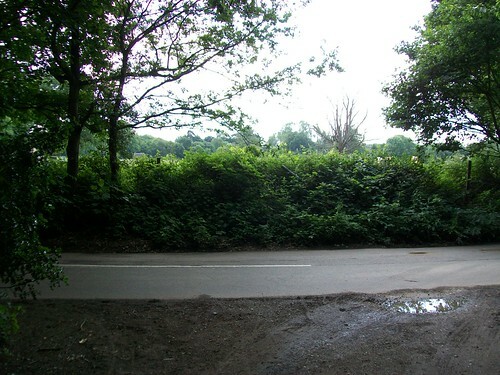 It’s flat, wide and straight – potentially a very fast piece of cycling infrastructure. Again due to the Olympics and Crossrail, there are some diversions in place. There were particularly poor involving much pushing the bike and queuing to allow road traffic in and out of the Olympic park. It would be nice if there’d been a few signs to as it’s really easy to miss where you should cross Stratford High St.
Further down the track there are many road crossings – each with a set of anti-cycling gates at each side. In most cases they seem to have been vandalised to allow free passage (probably for a few motorcyclist too…) but the odd one remains intact. 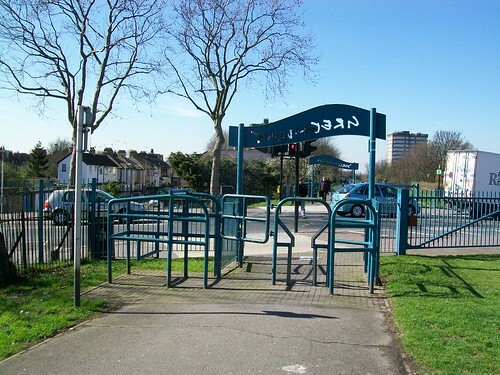 It does seem a bit odd to create some infrastructure for fast easy cycling and then add barriers to prevent take up. I know the main target is to prevent people running motorcyclists or quad bikes etc, this really doesn’t seem like the best solution. 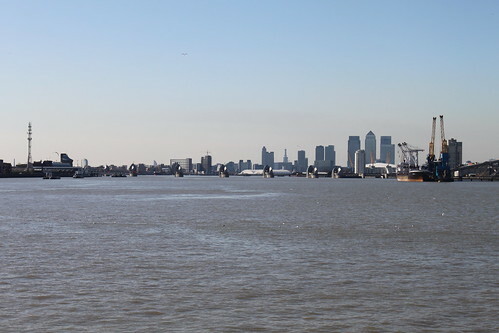 The main objective of the trip was to cross the river using the Woolwich free ferry. A strange anachronism of London down in the bottom right hand corner, the ferry connects the North and South Circular roads. 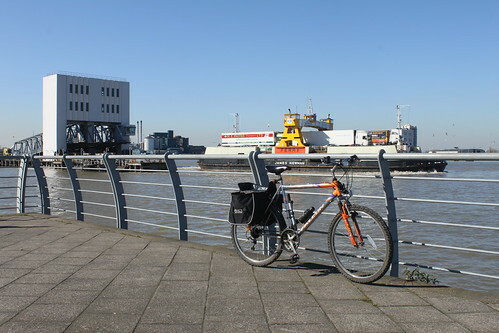 Apparently there is some legislation meaning there has to be a free crossing here – so the small ferry carries lorries, cars, bikes and pedestrians the short hop between North Woolwich and Woolwich. I wasn’t the only cyclist either! Crossing the river is quick and relatively easy – I was very lucky with where I was put on the boat, opening up a familiar view but from the ‘wrong side’ of the Thames barrier. Once on the south side however, it was pretty obvious the unwritten law (‘south London must be less good than north London’) rang true with respect to cycling facilities. The ‘Thames Coastal Path’ weaves between the riverside and busy roads with lots of ‘give up an push’ signs. In the end I gave up trying to follow the path round the Blackwall Reach peninsula due to the lack of sign posts! The roads of between Woolwich and Greenwich did have some advisory cycle lanes but on a Saturday afternoon were as snarled up as a rush hour. At least, I’m not sure how much worse the traffic could get at rush hour. By Greenwich I was pretty knackered – a quick pit stop and a chance to ‘refuel’ before heading under the river again using the foot tunnel. 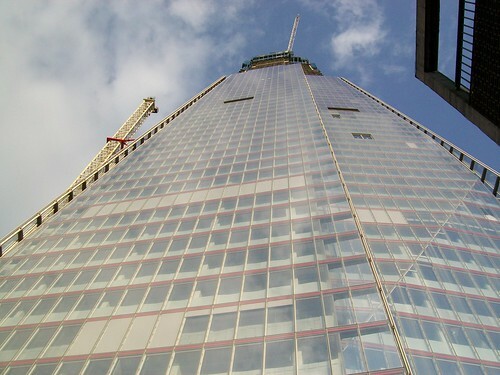 Currently under renovation, the lifts are closed. This meant carefully pushing the bike down a spiral staircase and the back up the other side. Apparently this is part of ‘National Cycle Route 1’ but I didn’t see any signs and you can’t cycle in the tunnel (probably for the best – it’s very busy with people walking). Even back on the north side of the river there didn’t seem to be any NCN1 signs – so I just hit the road and headed towards Poplar. There’s loads of interesting things on the back streets here so it was really cool to explore a bit, even if all of the roads did some how seem to lead to the A12, effectively a motorway. Eventually back to the Lea/Lee path and to the ‘stow. With 29.3 miles (46km) on the clock it was a new personal best. Still a long way to go though – need to nudge that above 40 miles and cycle every day for a while to ‘toughen up’. Where to venture next I wonder…? *Lea/Lee – it is spelt differently in places. No idea why.